We were honored to receive some VERY cool awards recently and it's about time we shared the news! Let me be clear, Waffles Too had nothing to do with this. He thinks everything is a hat. Seriously, what kind of cat IS he??? 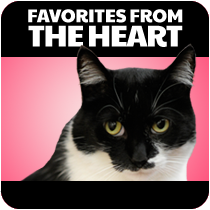 Our friends at My Positively Pets Blog just named me one of "The 10 Coolest Pets With Blogs!" They made an uber-cool infographic highlighting their top ten blog picks, with my picture and everything! We were suprised, humbled and in very good company with so many other awesome bloggers. Thanks Positively Pets! And if that wasn't cool enough already, our friends Hanna & Willow at Animal Tales just held the 2012 Animal Tales Blog Award Ceremony. 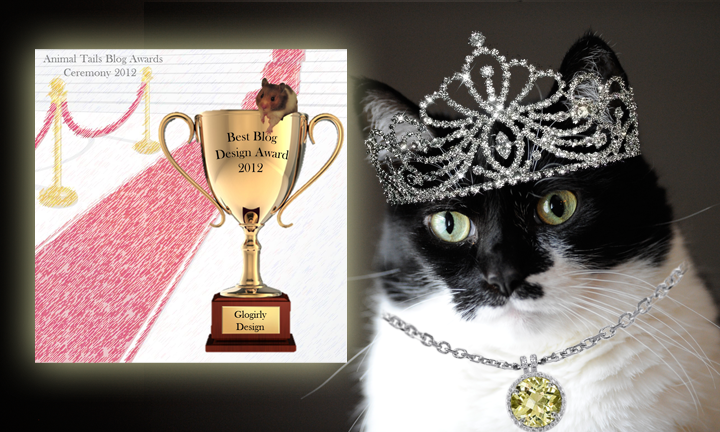 They honored us with the 2012 Best Blog Design Award...can you believe it!?! 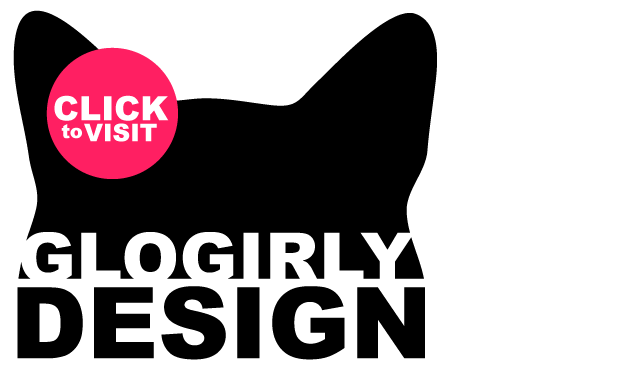 We had no idea they were doing this and are incredibly touched that they think so highly of our silly designs. There was red carpet and everything so I had to put on the Harry Winston. Thank you so much, Hannah & Willow! 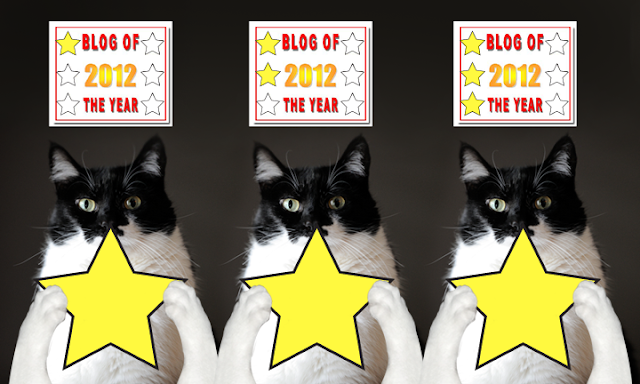 Glogirly and I have been seeing stars lately with all the cool Blog Of The Year awards going around the blogosphere. 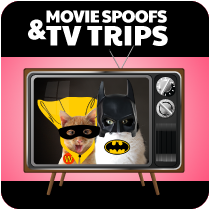 We received shiny stars from Nerissa at Nerissa's Life, Speedy at Speedy The Cheeky House Bunny and MeowMeowMans at Animal Shelter Volunteer Life! Thanks for the pretty stars, friends! We're sending you stars back! We also were given the "Honey I Shrunk The Pig – Many Babies Blog Award." Our sweet friend Karen Jo from Herman's Hideaway gave us this award in honor of Waffles Too, the orange *baby. * I think it should be called the "Honey Can You Just Make The Pig Disappear - Many Maniacs Award," but I won't waste time on syntax. I've given this award to the orange boy... for obvious reasons. Thank you, Karen Jo! Sometimes Glogirly forgets to acknowledge our awards and friends because she's.....well, she's human and we all know THAT can't be helped. But our awards are all so very special to us and we thank you from the bottom of our crusty little hearts for acknowledging us. 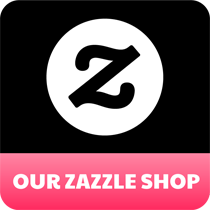 We invite you to take a peek at our special AWARDS PAGE where have all of our awards displayed. 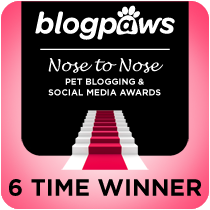 ConCatulations on The Coolest Pets with Blogs award as well as all of the others. 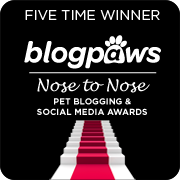 You have a pawsome blog and deserve all of your awards! Concatulations on all your awards. We too have a human who forgets to acknowledge them (often). Sigh. Concatulations on all your awards, Katie! You know, Katie darling, another unfortunate aspect of W2's irritating presence in your life is that you will need (quelle horreur!) to SHARE your awards with him. 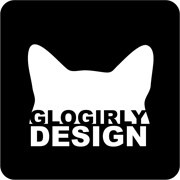 Now, it was one thing to share with Glogirly (she does, after all, make some small contribution to your blog). But you know W2 is just going to bask in the reflected glory of You, Wonderful You. I'm really not sure anything can be done about this. Legally. They are very nice awards and all well deserved! Whoa! Katie baby, Brad am sure is very proud of you and he's honoured to your man behind the scene. 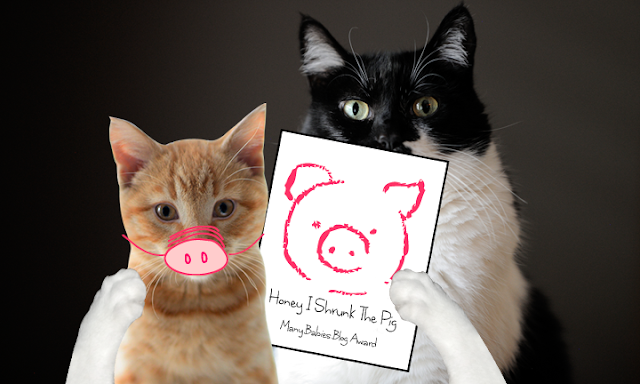 Hmmm....our Mama is bad with awards too....we've forgotten who had given what...oh well.... purrr....meow! Concatulations to you! 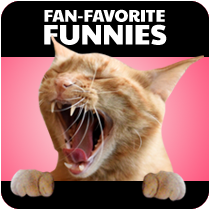 That is pawsome and we feel like we are famous by association. HahaMeow! Heh heh heh... nice hat Waffles. Aww I love the picture of Katie holding my infographic! You guys are awesome and all of your awards are well deserved! Congratulations on all your awards, Katie...oh, and to the orange *baby*. :D Oink oink! Concatulations Katie on all your awards! You deserve them! Concats to the little oinker too! Katie, you had better watch W2 so his fame doesn't go to his head & he tries to hog the blog! Oink! Great hat, Waffles. Does it double as a helmet so that Katie can't "correct" you? Congrats on the awesome awards! And on the shiny new hat for Waffles. Concatulations on your awards. Well done and well deserved. Have a terrific Thursday. Congratulations on all these awards! That graphic at the top made me laugh out loud. Way to go on those awards! What a great year and we have no doubt the next will be even better for you! Congrats on all your cool awards. 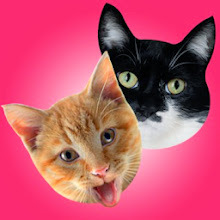 We think you are pawsome. Sigh humans you can blog without them but honestly sometimes they are asleep at the keyboard. we meant can't blog without them. Like we said humans. Katie, this is Coco Chanel. I just wanted to say that you look stunning in the Harry Winston. Yours or on loan? I don't know how you stand it, with W2 trying to share the spotlight. Congratulations to you (mama says I have to say Glogirly too, so, whatever). CONGRATULATIONS!!! So many awards but each and every one is very well deserved. Your blog is... FANTASTIC!!!!! Thanks so much for the beautiful Christmas card you sent. Bet the postman was super-duper jealous when he saw me gettin' an envelope with those beautiful stamps on it. Bet the US postal service will be wantin' to make them available to EVERYONE. Yup... they're that nice. Concats on the awards. Do something special— Have a pawty. Congrats Katie! I think you are going to need a bigger trophy case soon! Katie dear, we're so proud of you!! We wish everyone in your family a wonderful 2013. Miss Katie, you deserve all the accolades the world showers upon you! Congratulations! All awards are well deserved Glofamily! Congratulations! All your awards are well deserved. 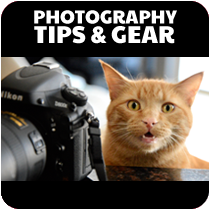 You are a great role model for those of us just starting out in the blogging world. I'm loving all your awards, you deserve them. Congratulations sweetheart. You deserve that fabulous award. Congratulations! The awards are totally well-deserved! Hip, hip, hurray for Katie and Glorgirl! Katie, (oh and Waffles Too), what wonderous and pawsome awards yous received! Concatulations! Yous deserves them all! 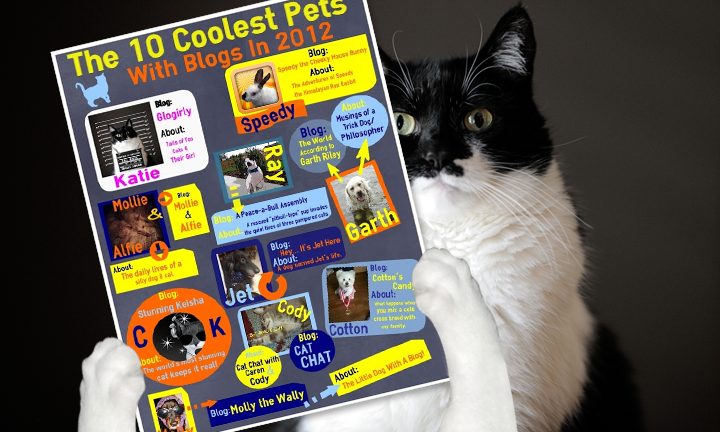 The Coolest Pets with Blogs. That you belonged in that category was never in doubt. 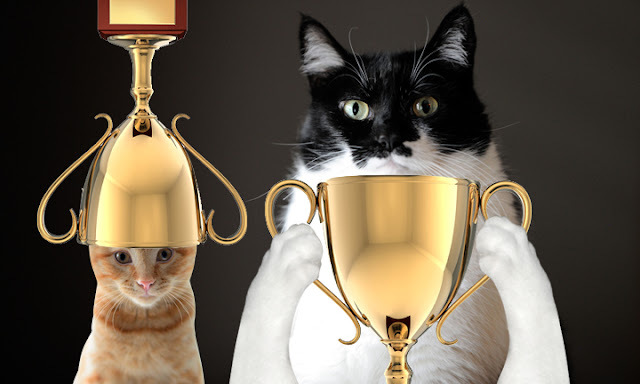 ConCATulations to all your award´s ! Congratulations. You'll need to build a blog just to follow your growing awards.